Gary Presley: Why Am I Compelled to Measure Entropy in the Middle of the Night? Why Am I Compelled to Measure Entropy in the Middle of the Night? I seem to have a compulsion to know the time when I wake up in the middle of the night. It's a strange habit, and one that crept up on me. There are all sorts of superficial problems that arise with a clock beside a bed. Sometimes I'll pop awake feeling thoroughly refreshed, ready to get on with the day, my head full of good thoughts and things to do -- only to glance at the clock and see that it's not even midnight. Conversely, it can sometimes feel good to wake up at one o'clock in the morning, look at the clock, sigh, and know I have four or five hours before I'm compelled to get out of my warm bed. Albert Einstein supposedly offered the opinion that "The only reason for time is so that everything doesn't happen at once." As for me, I think time is a human construct, an acceptable adaptation to our physical environment, and it makes sense only because we are generally tied to the cycle of the star we call the Sun and secondly because we have come to understand that our Selves are in a state of entropy, at least until they aren't any longer. That observation may be a mis-reading of Stephen Hawking. 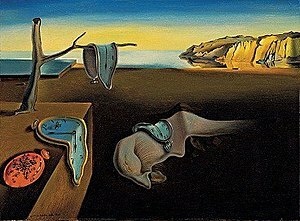 Looking at it from that perspective -- rather than from my bed -- the concept of time seems to be a bit of reverse engineering. We didn't have time, and so we had to invent it. Not to keep everything from happening at once, as the professor suggested, unless his wry simplistic comment possesses a truth I'm incapable of understanding, but rather to give an appearance of understanding the nature of things. I dislike time. Or perhaps, more accurately, I dislike entropy. That's a fool's passion, because entropy, from the Big Bang to (if there's sufficient Dark Matter) the Big Implosion, has, is, and will occur even if humankind didn't attempt to chart it with a clock. I dislike time. But invariably I wake up every night at least once and check the clock at my bedside, a little flat liquid crystal diode display of decay, a charting of dissolution, a reminder that no matter how hard I try disorder will dominate.